Pain is often treatable but doctors, medical professionals, and patients don't understand the intricacies of chronic pain. Millions who suffer from pain become hopeless. With Aches and Gains, Dr. Paul Christo, a Johns Hopkins physician and leading pain specialist sheds new light on what it means to live with and overcome chronic pain. 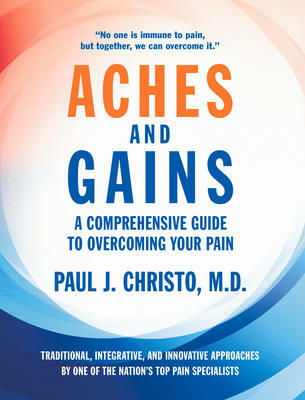 Dr. Christo shares celebrity interviews, including Naomi Judd, Lisa Swayze, Montel Williams, Ally Hilfiger, and Clay Walker, from his Sirius XM radio show Aches and Gains, and stories from patients who have found a way to overcome the pain that once controlled their lives. Offering traditional, integrative, and innovative methods of easing pain, the book is a life-changing tool for anyone associated with pain including pain sufferers themselves, doctors, nurses, medical professionals, and caregivers. Features a foreword by renowned talk show host Montel Williams.